Its a case of “all change” as Scott Hunter sadly leaves us. 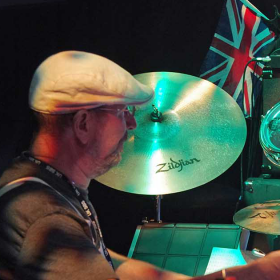 He joined us back in December 2014, when we auditioned 7 different drummers for the role of Phil Collins. His ease with some of the more challenging parts such as Apocalypse in 9/8 and Watchers of the Skies (it was surprising how many drummers struggle with that song!) left us in no doubt that he was the right choice. His dedication and disciplined approach to rehearsing was an enormous help to the band, whilst his warmth and sincerity made him a close member of our family. He will be sorely missed and we wish him much love and happiness in the future. We are delighted to see the return of the legendary Phildas Bhakta to the band. In spirit, she has never left the band and has been pining in the beautiful mountains of Switzerland (her home). 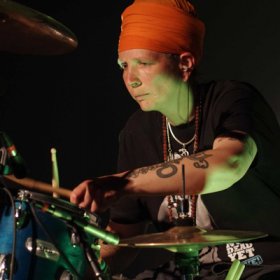 Following great shows in Holland at T’Blok (Prog Frog) where her drum solo blew the roof off, and the unforgettable gig at Charterhouse this year, we’re looking forward all of you to hearing that distinctively Collins sound at The Gamla, Oslo and Hanger Farm, Southampton. Please book your tickets now! 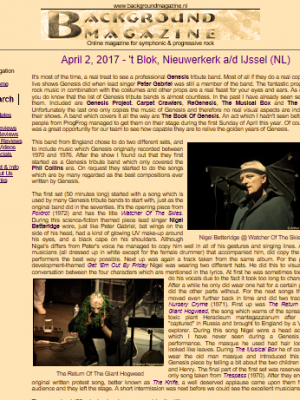 Read the 2017 review extract from Background Magazine: “….The fantastic progressive rock music in combination with the costumes and other props are a real feast for your eyes and ears … A band which covers it all the way are The Book of Genesis.“ – by Henri Strik. Please come to Colchester Essex at Arts Centre as a Big Genesis Fan of Early Days and love see you do watch of the skies …along with the Knife..